" Ideal for heavy use by an individual, or for general use in a small office or low-volume department. " 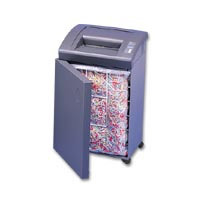 The GBC 2250X Office Shredder - The Shredder has an auto on-off button. EZ-Feed throat. Bag Full shut off. 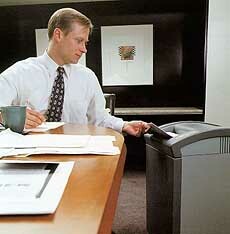 1.75 cubic feet shred bin combined with cross cut bulk reduction lets you shred four times longer between bag changes. SmartShred Controls-separate indicator lights for power on, bin full, overload and door open. Continuous duty rated motor never needs a cool down period. Easy roll casters. Shipping Weight � 41 lbs. Recommended Shred Bags � UNV35948 and FEL36054, both sold separately.